Whenever it gets cold and my Facebook friends start posting photos of their snowy homes, I get Billy Idol's White Wedding stuck in my head. So, it seemed fitting that I would put together a White Wedding Pinterest board. White weddings can be so classy. The best way (in my opinion anyway) is to have mostly white decor and then accent with shiny metallics (silver, gold, or pewter). It will look so classically romantic that way. Stick with baby's breath (which is really classically popular) and white hydrangeas. Your flowers will look beautiful, will match with your theme, and they'll be really cheap. I picked six of my favorite pins from our White Wedding Pinterest board (there are a lot more on the board itself, so definitely take a peek). I labeled each of the photos above, then linked to them below, so you can quickly go to those pins and repin them to your wedding planning boards. White Wedding Inspiration Board pins: 1. 2. 3. 4. 5. 6. I love this tablescape above. The gold accents make the white wedding look beautiful. And the gold chairs and gold silverware are a plus. Plus, if you look closely, the guy in the background is also wearing white so that's a bonus (the guy next to him in black, not so much). I love the white tent with the white lounge couches under it too. I'm such a fan of Venetian hours. I mean, who doesn't love unlimited desserts? If I could have had a dessert-only wedding, that would have been the dream. That's not reality, though, so you just have to incorporate more desserts into your wedding, like these marshmallows. Dip them in white chocolate then in white nonpareils (while the chocolate is warm). Simple and delicious. When you're planning a white wedding, you definitely need white invitations. Sites like Minted make this really easy. You can search invitations by color, so that will limit what you have to look at. You can also create custom colors on the site too. There are invitations that allow you to change colors, so just pick white and whatever accent color you like best to create your perfect white wedding invitation. I love the drapery on this chair, but even more, I love the pearl brooch that's holding it together. It so beautifully matches the silver chair. And I bet there are more silver accents on the table. With a white wedding, it's these simple accents that will stop your white wedding from completely looking washed out. I love baby's breath for boutineers and bouquets for a white wedding. They're a lot cheaper than other flowers since they're generally just filler. Plus, it's easy to put these together yourself (since you don't have to worry about how various flowers will flow together). And baby's breath holds its white color when you dry it, so that makes preserving these really simple. A white wedding wouldn't be complete without a white wedding cake. The one above is so simple from the back and beautiful from the front. Be sure to position it with a wall as the backdrop so none of your guests stare at the boring backside all night. If you wanted to dress it up a little, silver fondant pearls around the tiers would make this a bit more glamorous. 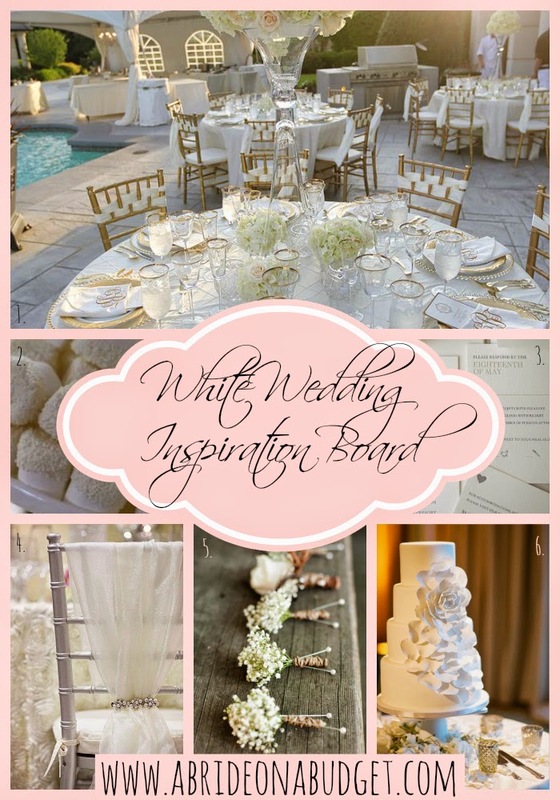 BRIDAL BABBLE: What pin from our white wedding inspiration board is your favorite? The white wedding cakes and the white marshmallows are my favorite pins. Loving the white them, so classic! I Love the lace detail on the back of the chairs. Beautiful ideas would be so nice for any wedding. Gorgeous wedding inspiration. The centerpieces and chair decor are my favorites. These pictures are gorgeous. An all white wedding does look classy. Thanks for sharing! YAAAAAAS!!!! White done right! Totally agree with your interpretation. If you are going to have a white wedding, glam it with metals, golds, silvers, etc. to really make it pop! I've been saving things, but didn't occur to me to put together a pinterest board even though I'm always looking at them - you've picked so many nice things, it is inspiring me to start one!!!! White can be so wonderful in so many ways!!! These are some beautiful ideas for a white wedding! White is still classic and elegant. I love it paired with gold. Such a pretty board! I love it! I believe white is very classic and clean looking. So many pretty ideas. Just about everyone I know has pinterest pages for their wedding, how can you not?!! !